There’s something special about a group of people that make time to put themselves in metal tubes and shoot themselves thousands of feet above the earth for a living or a hobby. Every Saturday morning a group of pilots that have built apartments in their hangars (apparently this is a normal thing to do) meet for breakfast at the regional airport cafe where they live. I learned swiftly that if you are invited to this breakfast once, you have been initiated and it is expected you will make it a part of your Saturday mornings from then onward. So, Saturday mornings I wake at the crack of dawn and drive down to the regional airport – an airport so small it hasn’t even a tower – and have breakfast with this group. After breakfast, most of them “go up” and if you play your cards right, one of them will let you tag along. If you happen to be a petite blonde woman, as I do, you often have the opportunity to fly their plane for a bit too. And this is how I managed to fly my first Grumman Cheetah last Saturday and my first Piper Cherokee the month before. These breakfasts are a great opportunity to meet CFIs (certified flight instructors), learn the lingo of the aviation community, and find the local “board” – a cork board where airplanes and airplane parts and service sales are advertized. It’s not exactly a community of social media savvy individuals and I’m told every airport has a similar board. It’s also a great place to network and find out what is a reasonable price for plane rental, flying lessons, headsets, and other aviation gadgets. I had it in my head I would rent a plane from the local flight school and was warned it was the most expensive way to go. I was trying to figure out how to balance a full-time job with ground school until I heard there are accelerated ground school classes you can do on the weekends for a fraction of the cost. These guys know every trick in the book and are happy to share it with you, but you have to show up. It’s a very informal meeting and I imagine anyone could walk in, find a table of pilots, express they are new to flying and wanted to meet some people and they would be welcomed with open arms. Pilots love pilots. They just get each other. It’s a different kind of community, especially for women. Every time I share with a girlfriend that I’m learning to fly I always get the same reaction, “oh my gosh! Were you so scared?! Did you worry you were going to hit a bird? Did you go really high? Could you open your eyes up there? That is so dangerous!” I don’t get this kind of reaction when I’m around pilots. They want to know what I flew, how it handled, and what types of things I learned. It’s a very supportive community and I think seeing a young woman express an interest in flying is a breath of fresh air to them. To be fair I have met one other woman that frequents the cafe that is working towards her private pilot license. Boom. Instant girlfriend that won’t freak out on me every time I have a flying story! Pilots are also an easy-going bunch. My instructor has a habit of saying “nothing happens fast in an airplane.” I’m beginning to see what he means. [Spoiler Alert] Hollywood got it wrong again. When you’re in a single-engine airplane, there is lots of time. The sky is so big, it takes a while to get anywhere. Even touching down on the runway feels like it is happening in slow motion. Perhaps by necessity the piloting community is a very relaxed bunch. You have to keep your wits. On my second flight up, we learned we forgot to close the hatch door about 500 feet up during takeoff. My instructor kept calm, I kept calm, he latched t he door shut, the lesson went on. I’m discovering things like that happen all the time in an airplane. Especially when you’re learning. 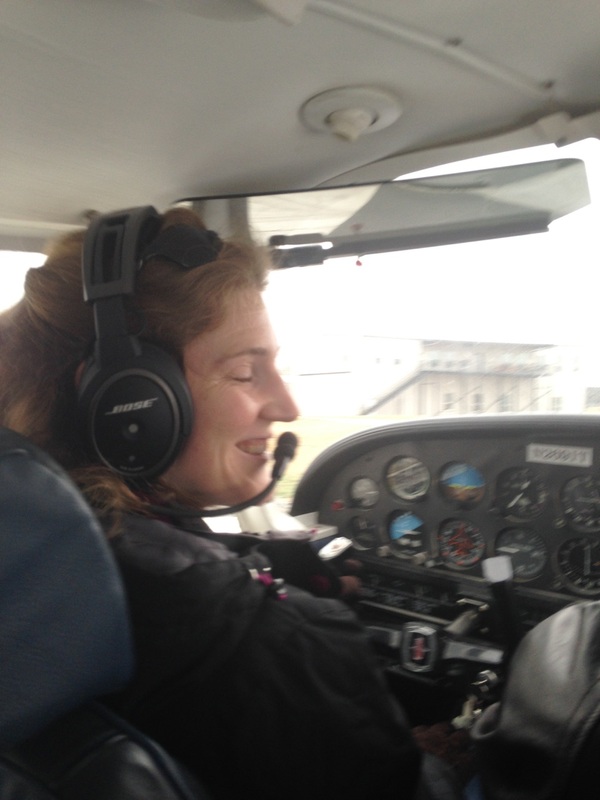 On my last flight up – my first really windy day and first cross-country flight – I accidentally crossed into the flight path of another runway as I tried to circle back for touch-and-go practice. The air traffic controller gave a reprimand, my pilot apologized and explained to me what I had done, and the lesson went on. It happens. Lots of things happen in an airplane. Freaking out about them is not a good reaction. Ergo pilots are a well-humored, very forgiving troupe…and they’re always excited to see you for Saturday breakfast. 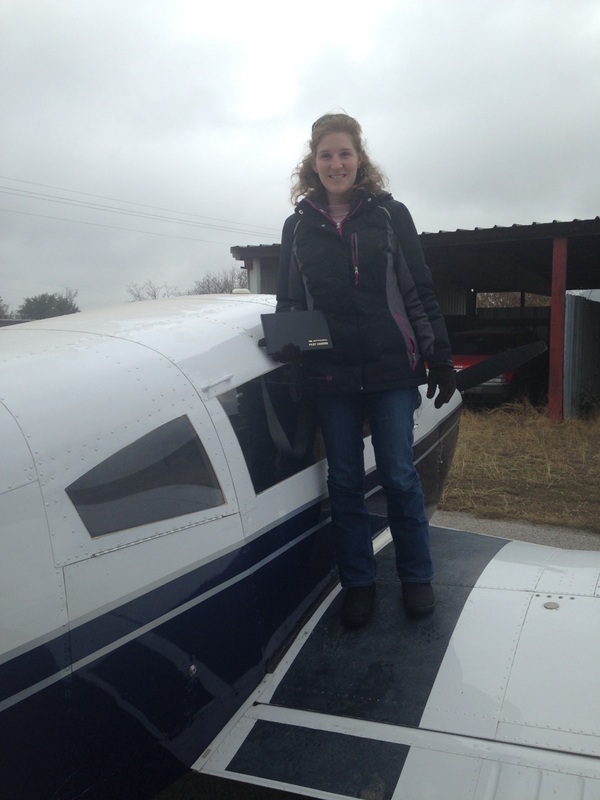 Awesome post on what it’s like to be a female pilot & what it’s like to learn to fly! You go girl!!! Great article. Full of great in site. Loved the breakfast tips. I have to get my self into them. Great article and I am so happy that you have discovered one of the wonderful secrets in the world. Once you escape the pull of gravity the world takes on a different perspective. You might be surprised about the welcome you received by the middle aged white guys but I am not because aviation does not recognize gender, race, religion, or anything else that separates Earth bound humans because up there we are all equal. Go to this site and make yourself known with a comment. Tell Karlene that rob sent you and I promise that you will immediately feel right at home. Thanks for the warm welcome and a great contact Rob!